Is your Enterprise Using The Right Tools To Manage Data? Big Data has come in as a boon for many companies eager to improve their sales and revenue and has been the solution many businesses have been searching for in their effort to streamline their operations. It is a revolution in itself and slowly it is taking over the business world. In today’s complex business environment, Big Data solutions are probably the only way to accumulate a large amount of data that can help improve business standards. But is gathering a large amount of data enough? No, analyzing the data and drawing inferences out of them is what really matters which is why Big Data analytics tools play a crucial role. But with the thousands of tools available for managing Big Data, choosing the right one can become difficult. You have to understand which analytics tool can help you manage your skill sets, and you have to know which one is right for your project. Read on to know about useful Big Data and Analytics Tools for your Enterprise In the below mentioned list, we highlight some of the top Big Data and analytics tools you should be looking at as a business to manage all your data the right way. Hadoop is easily one of the most prominent Big Data tools available in the market. It has an open-source framework that allows distributed storage of large datasets that you can scale up or down according to your requirement. The best part of Hadoop is that the risk of hardware failures is minimal letting you rely on its services without any worry. However, Hadoop is not for novices. You need to have a firm control over Java to make the most use of this tool. If you are not a wiz handling Hadoop can be troublesome. This is where Cloudera comes to the picture. Cloudera is nothing but a brand name of Hadoop but is much more user-friendly. It allows enterprises to manage their data far more efficiently because it does all the hard work for you. Cloudera also comes with a certain degree of data security features that is definitely an added advantage. 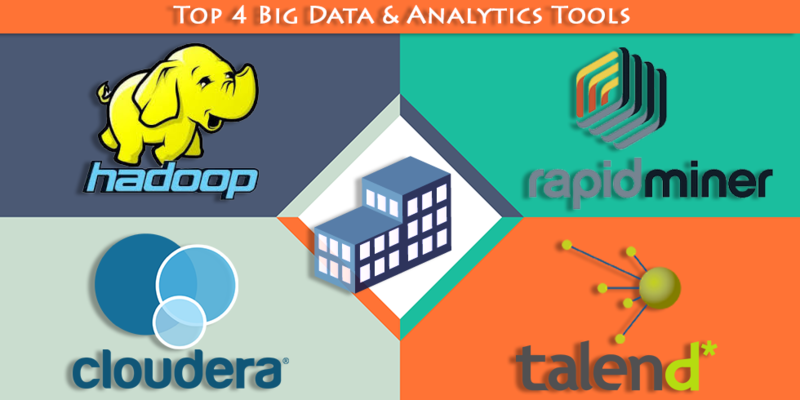 Talend is another great Big Data analytics tool. In fact, Talend offers more than just analytics but right now we will focus just on its Master Data Management (MDM) feature. MDM helps you combine real-time data with applications and makes it easy to integrate embedded data quality with stewardship. Another great reason why Talend is a great option is because it is open source. An essential element of data analysis is prediction. When this is an important concern with your Big Data, you need to start using RapidMiner, a powerful predictive analyzer. It is RapidMiner’s ease of use that has an active open source community behind it. A major feature of this tool lets you integrate your specialized algorithms through its APIs so that you get better results. If you want to use Big Data optimally, do not expect to do all the work alone. You need the help of Big Data Consulting services specialized in analyzing data and suggesting the best tools for you. You can get in touch with Semaphore Software so that you get the best services. Write to us at info@semaphore-software.com to know more.